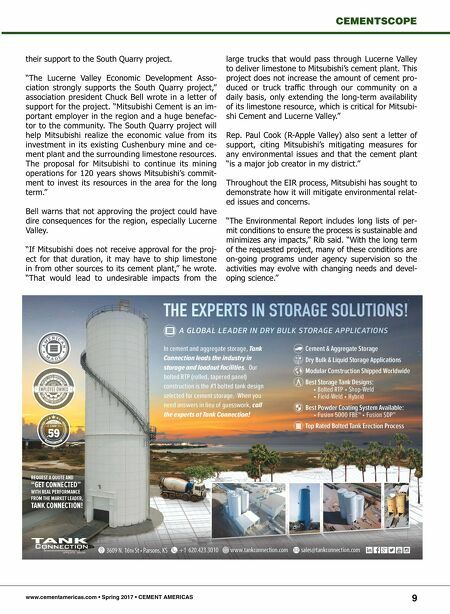 www.cementamericas.com • Spring 2017 • CEMENT AMERICAS 9 CEMENTSCOPE their support to the South Quarry project. "The Lucerne Valley Economic Development Asso- ciation strongly supports the South Quarry project," association president Chuck Bell wrote in a letter of support for the project. 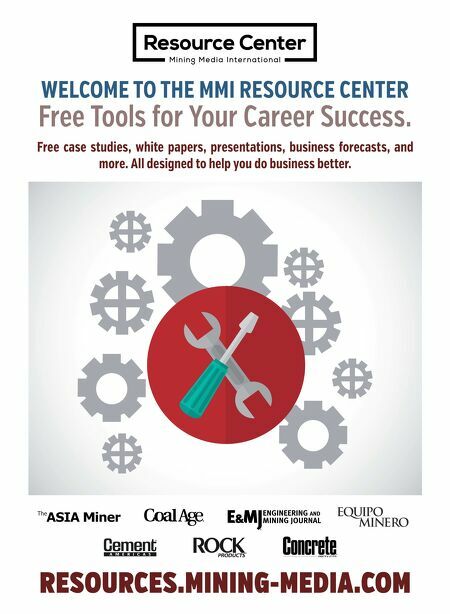 "Mitsubishi Cement is an im- portant employer in the region and a huge benefac- tor to the community. The South Quarry project will help Mitsubishi realize the economic value from its investment in its existing Cushenbury mine and ce- ment plant and the surrounding limestone resources. The proposal for Mitsubishi to continue its mining operations for 120 years shows Mitsubishi's commit- ment to invest its resources in the area for the long term." Bell warns that not approving the project could have dire consequences for the region, especially Lucerne Valley. "If Mitsubishi does not receive approval for the proj- ect for that duration, it may have to ship limestone in from other sources to its cement plant," he wrote. "That would lead to undesirable impacts from the large trucks that would pass through Lucerne Valley to deliver limestone to Mitsubishi's cement plant. This project does not increase the amount of cement pro- duced or truck traffic through our community on a daily basis, only extending the long-term availability of its limestone resource, which is critical for Mitsubi- shi Cement and Lucerne Valley." Rep. Paul Cook (R-Apple Valley) also sent a letter of support, citing Mitsubishi's mitigating measures for any environmental issues and that the cement plant "is a major job creator in my district." Throughout the EIR process, Mitsubishi has sought to demonstrate how it will mitigate environmental relat- ed issues and concerns. "The Environmental Report includes long lists of per- mit conditions to ensure the process is sustainable and minimizes any impacts," Rib said. "With the long term of the requested project, many of these conditions are on-going programs under agency supervision so the activities may evolve with changing needs and devel- oping science."